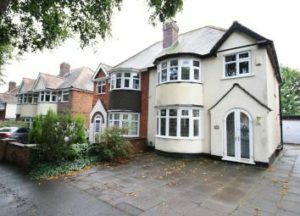 Mr Bailey was looking for help with clearing the large property, including four bedrooms, three downstairs spaces and a double garage. He requested we take everything from the property, stressing that nothing should be left behind and that it should be completely empty. We had been informed and warned by Mr. Bailey about the size of this clearance, a large four bedroom detached house in Erdington, Birmingham with a packed garage space. He had told us most of the belongings were junk, or of not much value and he was keen on getting rid of everything so that he could quickly try to sell the house. As such, we gathered some extra hands to organise and clear the many belongings, focusing on sifting through the packed garage space that Mr Bailey had told he had not the energy to go through. There was lots of home decoration materials, unusable paint, wallpaper, hardened brushes, various tools and broken parts. Most of the garage we knew would have to be thrown away or recycled, however there was some charming modest pieces, such as a vintage wooden record cabinet and some retro beech stools that would look lovely in the right home. The rest of the house had rather standard furniture pieces and were not in a very good state, either stained or showing signs of wear. There was a pool table in the backroom overlooking the garden and many board games and puzzles that reminded us all of our youth. The team was upbeat throughout and we managed to clear and store all the belongings within a two day period. Read about another Birmingham house clearance. Mr. Bailey was very happy with the speed of the Erdington house clearance it took for us to clear the large property. He said that we followed his clear instructions without any fuss or mess, saying that the whole process was efficient and stress free. He recently sold the property and say’s that he wouldn’t have been able to do it without our help.